Add layers of interest to your outfit! 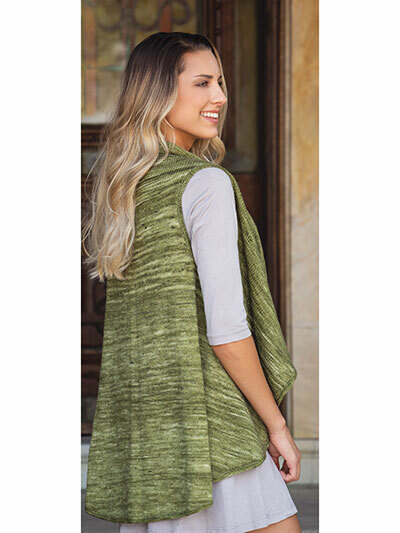 A simple shape and exquisite yarn make for a stunning shrug you can wear all year long. Body is worked back and forth in one piece to armholes, then fronts and back are worked separately to shoulders and rejoined for collar. Knit with sport-weight yarn using U.S. size 6/4mm needles. Design was originally published in Creative Knitting Spring 2019. Back width (shoulder to shoulder): 14 (15 1/4, 16 1/4, 17, 17 3/4)"
Back length: 29 (29 1/2, 30, 30 1/2, 30 1/2)"